Integrated under one web interface TRANSFAC and PROTEOME (containing the HumanPSD and TRANSPATH databases) provide well-structured data, assembled from the scientific literature by subject matter experts and organized in an accessible and easily searchable manner that enables the users to identify connections between disparate pieces of information and to apply that knowledge to their specific topic of interest. Integration of TRANSFAC and PROTEOME under one interface allows seamless analysis with the integrated tools and functionalities. 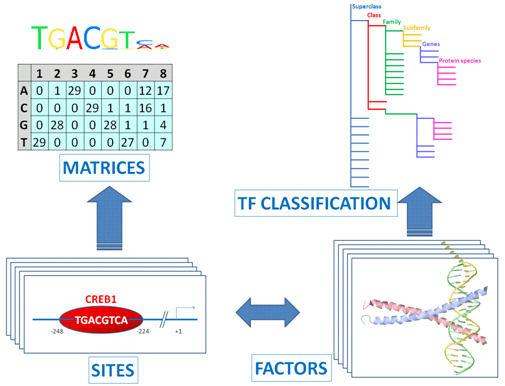 TRANSFAC is the database of eukaryotic transcription factors, their experimentally determined genomic binding sites, derived DNA-binding motifs (PWMs), and target genes. It can be used as encyclopedia of transcriptional regulation, or as a tool to identify potential transcription factor binding sites (Match/FMatch/CMsearch). Integrated transcription factor ChIP-Seq, DNase hypersensitivity and histone methylated intervals from the ENCODE project complement the curated binding site data. Moreover, TRANSFAC contains experimental data on miRNAs and their target sites. Download binding fragments from individual ChIP experiments in fasta or bed format, or lists of nearest genes, for analysis with FMatch or other tools. PROTEOME includes HumanPSD, a catalog of human genes and their mouse and rat orthologs, complemented by mammalian signal transduction and metabolic pathways (TRANSPATH). Its focus is on the association of human (and mouse) genes with diseases (or disease models in mice) and their potential use as biomarkers, including type of gene-disease association and indication. The protein-disease associations curated in-house have been complemented by integration of protein-drug associations and clinical trial information from DrugBank and ClinicalTrials.gov. Other information includes molecular functions, biological roles, localization, and modifications of proteins, expression patterns across cells, tissues, organs, and tumors, and the physical and regulatory interactions between proteins and genes. Despite a strong focus on human, mouse and rat, PROTEOME contains information on a broad range of species with focus on more than 20 model organisms including yeast, worm (C. elegans), and various plant organisms.